22 Summer Camps in for "Strafford, NH"
The Nike Baseball Camp at Southern New Hampshire University in Manchester, NH, is a great opportunity for players of all abilities to refine their skills, have fun and become better players. Weeklong, day and overnight summer programs held at 150+ campuses nationwide. UNH, is located in Durham, in beautiful New England and is designed to help competitive swimmers gain the edge they need to get ready for the season and compete at the next level. Campers choose from over 50 program choices! Birch Hill offers 2, 4 and 6 week sessions! 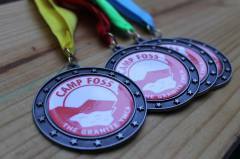 At Camp Foss, we design camp programs that focus on fun and adventure. Explore creative problem solving and collaboration through fine and manual arts. Wingedspur Farm has been a family owned and operated business since 1968. Shoals Marine Laboratory offers 2 high school programs (in addition to its programs for college undergraduates): Marine Environmental Science and A Marine Approach to Introductory Biology. Christian camping for those with a taste for innovation and excellence. Over 300 acres on New Hampshire's largest lake.